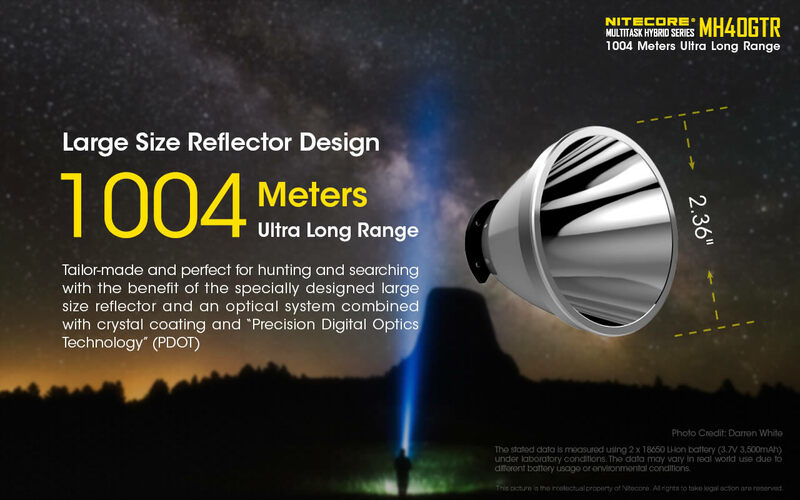 The NITECORE MH40GTR, with a maximum 1200 Lumen, has an ultra-long throw of 1097 yards, reaching nearly 10 football fields. 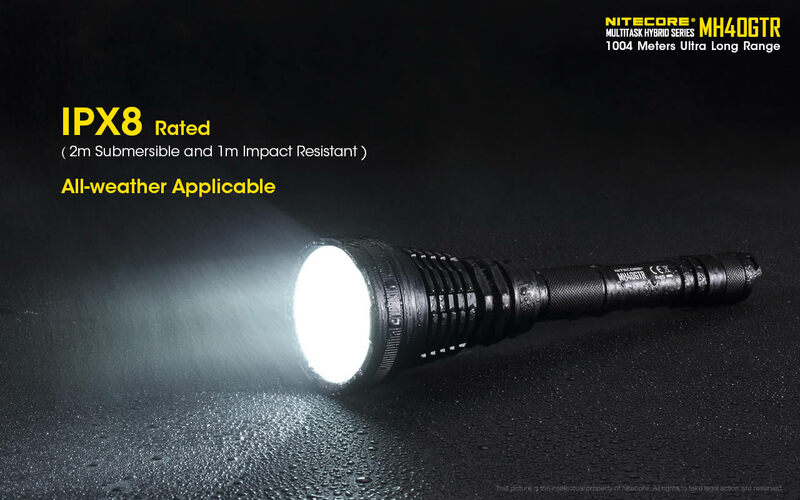 The MH40GTR is equipped with a premium CREE XP-L HI V3 LED bulb that puts out six light modes (Turbo, High, Mid, Low, Strobe, SOS) which are essential for any outdoor adventure or tactical situation you may encounter. 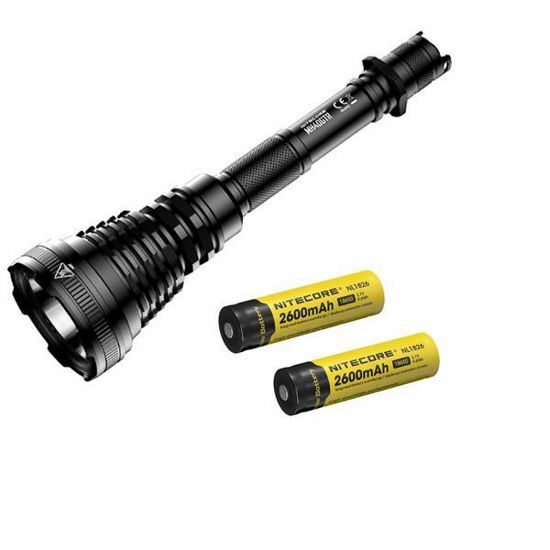 In addition, the MH40GTR's aerospace-grade aluminum alloy construction and innovative port cover design makes this flashlight waterproof so it can be used in all weather conditions. 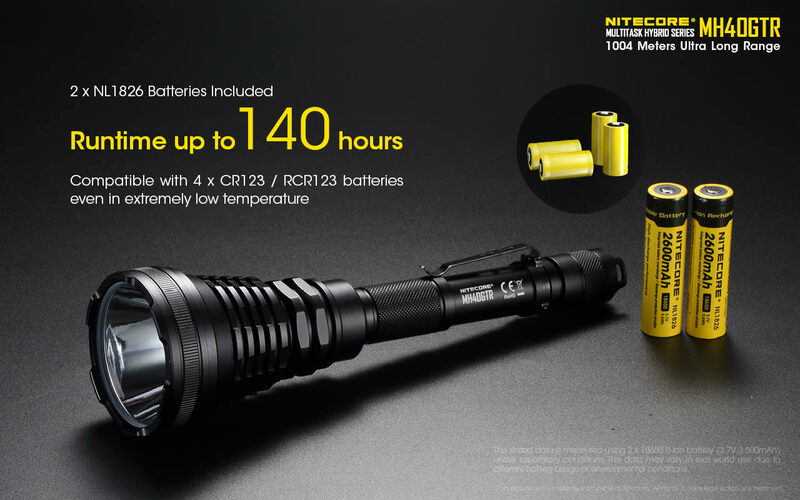 The true power of this flashlight in not just the 1200 Lumen, but the amazing 252,000 candela peak beam intensity. Lumen by definition is the total light output while candela is the brightness of the focused beam. 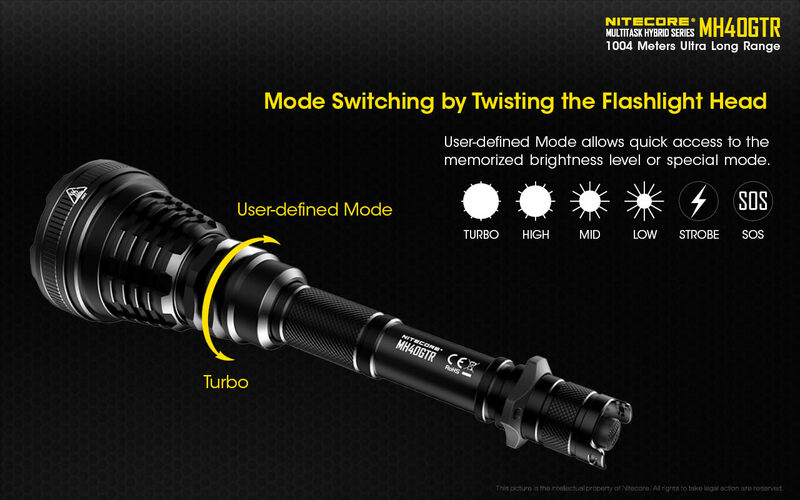 The NITECORE MH40GTR, with a maximum 1200 Lumen, has an ultra-long throw of 1097 yards, reaching nearly 10 football fields. 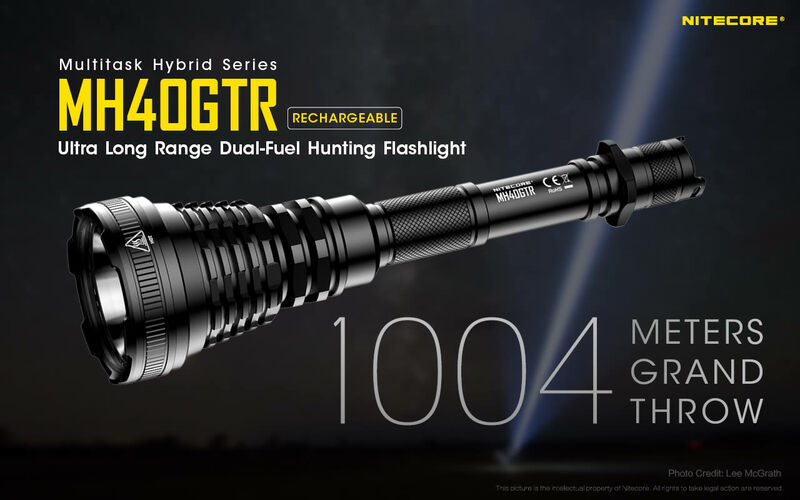 The MH40GTR is equipped with a premium CREE XP-L HI V3 LED bulb that puts out six light modes (Turbo, High, Mid, Low, Strobe, SOS) which are essential for any outdoor adventure or tactical situation you may encounter. 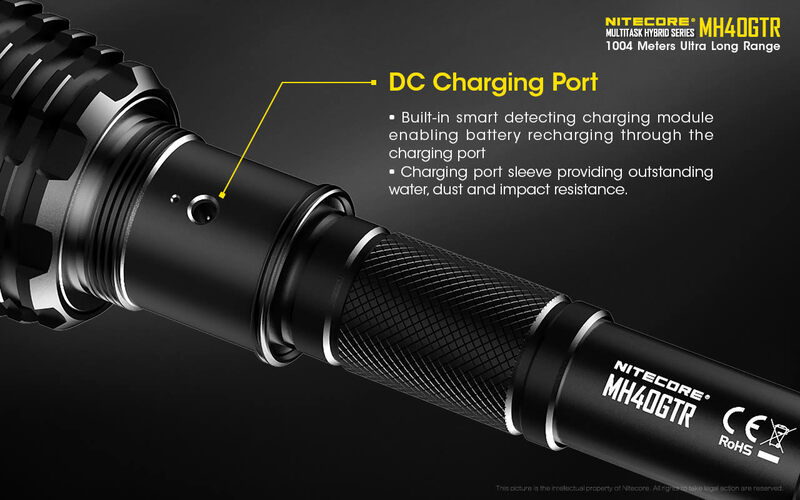 In addition, the MH40GTR's aerospace-grade aluminum alloy construction and innovative port cover design makes this flashlight waterproof so it can be used in all weather conditions. 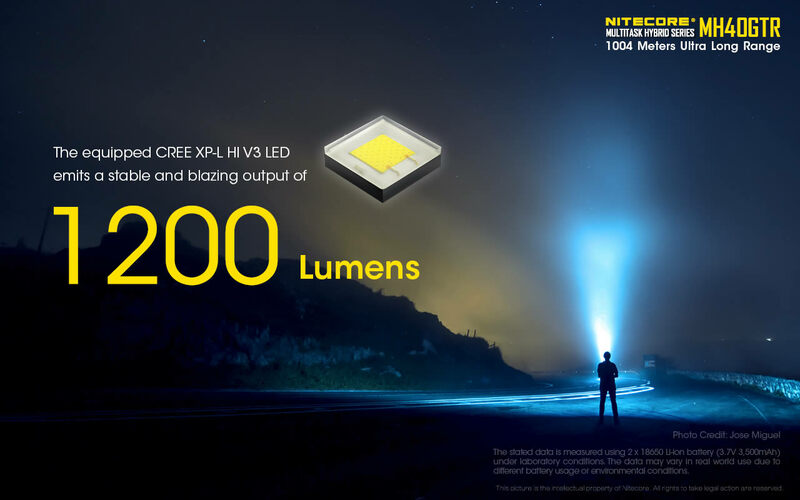 The true power of this flashlight in not just the 1200 Lumen, but the amazing 252,000 candela peak beam intensity. Lumens by definition is the total light output while candela is the brightness of the focused beam.